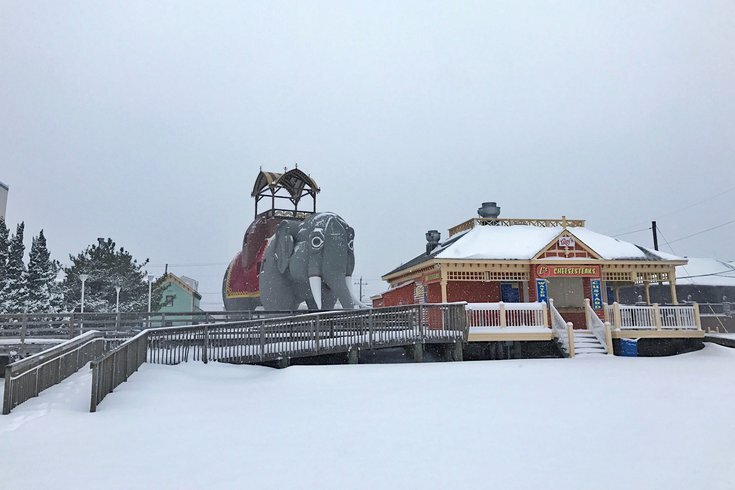 Lucy the Elephant in a snowscape in Margate, New Jersey. A winter storm watch has been declared from Wednesday night to Thursday night at the Jersey Shore ahead of a rapidly intensifying Nor'easter that looks to drop several inches of snow as it moves up the Eastern Seaboard. The advisory, which goes into effect 9 p.m. Wednesday and includes nearly the entire New Jersey coast, including Atlantic City, Cape May and Long Beach Island, calls for accumulations of as much as a half-foot of snow. Travel conditions during the Thursday morning commute are expected to be difficult, forecasters said, as strong winds – plus gusts of 40 mph – and drifting snow are likely. Forecasters said they may, at some point, issue a winter weather advisory for some counties located west of the watch area. From 2-3 inches of snow could accumulate in Philadelphia. Wind chill advisories also may be posted due to the strong winds and cold temperatures with a real-feel temperature from 5 below to 15 below on Thursday and Friday nights. Forecasters see rapid strengthening – or cyclogenesis! – while the storm is east of Florida, and then it moves quickly northward off the coast with nothing to block its path. 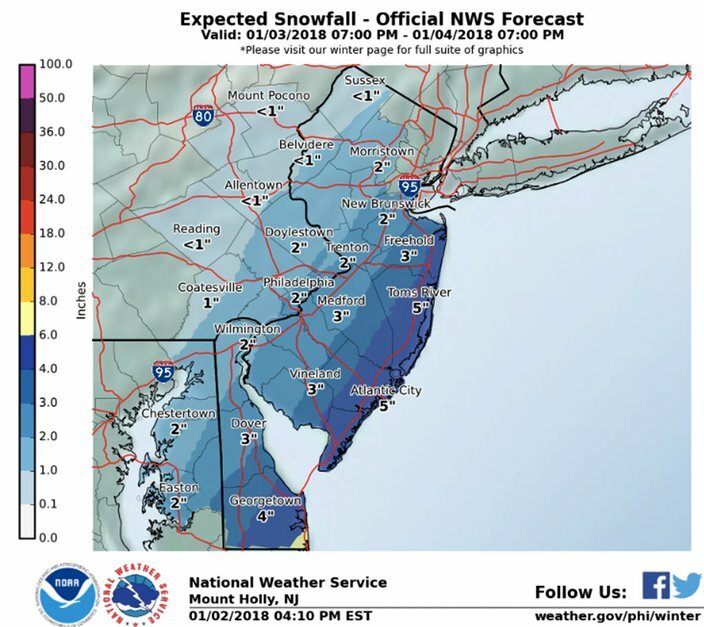 Weather models predict the storm track shifting westward, bringing snow to South Jersey, though the National Weather Service expects a sharp drop-off in snow accumulations as one goes westward across the forecast area. Adding to the challenge of their snowfall forecast, forecasters said other atmospheric factors could pull the precipitation even more to the west, though those conditions may occur too late to have any impact. Tonight: Clear, with a low around 12. West wind 3 to 7 mph. Wednesday: Increasing clouds, with a high near 30. Calm wind becoming southeast around 5 mph in the afternoon. Wednesday night: Snow likely, mainly after 4 a.m. Cloudy, with a low around 21. Light and variable wind becoming north 5 to 9 mph after midnight. Chance of precipitation is 70 percent. New snow accumulation of around an inch possible. Thursday: Snow likely, mainly before 1 p.m. Cloudy, with a high near 28. Blustery, with a northwest wind 15 to 22 mph, with gusts as high as 44 mph. Chance of precipitation is 70 percent. New snow accumulation of 1 to 2 inches possible. Thursday night: Partly cloudy, with a low around 10. Blustery, with a northwest wind 18 to 22 mph, with gusts as high as 39 mph. Friday: Mostly sunny, with a high near 16. Breezy. Friday night: Partly cloudy, with a low around 6. Breezy. Saturday: Sunny, with a high near 14. Saturday night: Mostly clear, with a low around 6. Sunday: Mostly sunny, with a high near 26. Sunday night: Mostly cloudy, with a low around 20. Monday: A chance of rain and snow. Mostly cloudy, with a high near 40. Chance of precipitation is 40 percent. Monday night: A chance of rain. Mostly cloudy, with a low around 31. Chance of precipitation is 50 percent. Tuesday: A chance of rain. Partly sunny, with a high near 41. Chance of precipitation is 30 percent.